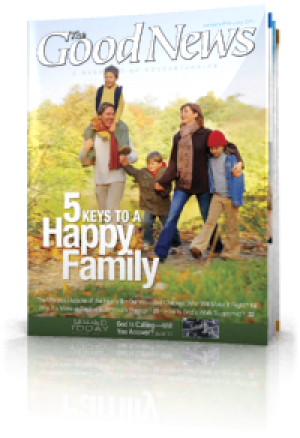 The January-February 2014 edition of The Good News highlights what you can do in building a happy family. 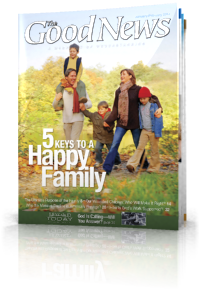 If you apply the five keys covered here to having a happier family, you can help make your family secure, service-oriented and successful. This leads us into the ultimate purpose of the family, a lesson that transcends time and cultures. 1 What's the Purpose of Family? 4 Why Are Young Christians Divorcing? 6 Will You Wait for Each Other? 7 Our Wounded Children: Who Will Make It Right? 9 Why the Massive Decline in America's Prestige? 10 What's Behind America's Growing Dependency Society? 13 How Is God's Work Supported? 14 God Is Calling - Will You Answer? 16 Valentine's Day: What's Wrong With Showing Love?